Fish curries are immensely popular in Bangladesh, and this recipe is a shining example of why. Meaty chunks of white fish are simmered alongside chunks of daikon radish in a mildly spiced sauce, that's simply begging to be soaked up with fluffy white rice. For more authentic Bangladeshi recipes, see Dina's feature. Bangladesh is the land of fish and rice. This dish is traditionally cooked with a freshwater fish called Rohu, which belongs to the carp family. It’s available frozen in Bangladeshi grocery shops, however you can substitute with large chunks of cod or another white meaty fish. Daikon is called moola in Bengali and is a staple vegetable used in meat, fish and vegetarian dishes. The subtle sweet taste of this vegetable pairs well with the mild flavour of white fish. There’s freshness from the coriander added at the end and the jhol (or gravy) is light and mildly spiced. 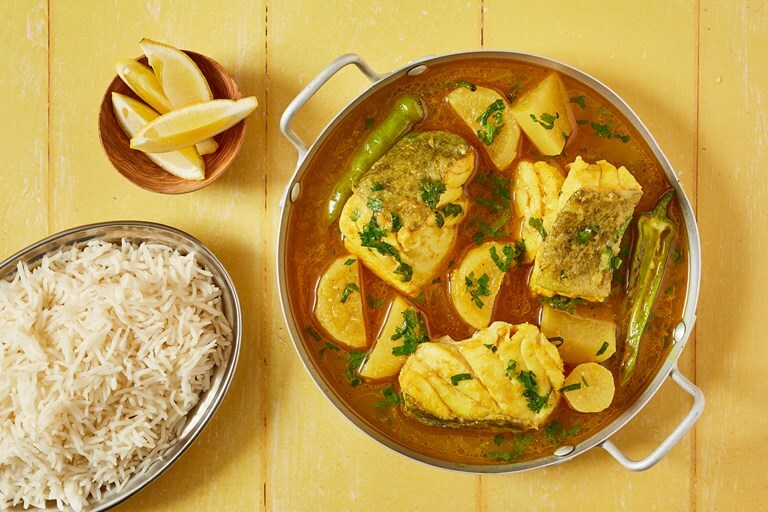 Most main or curry dishes in Bangladesh are served with boiled white rice and it’s a prerequisite for this dish as the fish and daikon are the heroes of the meal. A squeeze of lime – in particular Bangladeshi lime, which is very aromatic with a knobbly green peel (available from Asian grocery stores) adds the perfect finish.